The PodoView© Flatbed is a flat computerized podoscope equipped with a scanner, which is linked to a PC. The device is used to measure and analyse the plantar surface of the foot. This program operated flatbed 3D laser scanner scans the plantar surface in 3D in a load-bearing or semi-load bearing position. It provides the 3D surface of the plantar surface as well as an image of it. 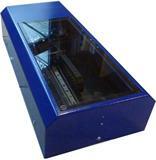 It can also scan foam boxes or casts in 3D or even simple blueprints in 2D. Our laser scanner is fully automatic and takes less than 5 seconds to scan in 3D and 2D at the same time. The FootScanner FTS-1©, the most basic device of the FootScanner© series, is a 3D foot digitiser that allows the instantaneous capture of a load bearing foot in order to create a 3D computer model of the foot. This uniquely designed device projects structured light onto the foot in such a way that no physical contact is necessary. With the touch of a button, the FTS-1© instantly captures the basic measurements of the foot (length, width, ball girth and instep girth). Applications range from half measure inventory management to the manufacturing of made-to-measure shoes. The FootScanner FTS-2© is a 3D foot digitiser that allows the instanteous capture of a load bearing foot in order to create a 3D computer model of the foot. This uniquely designed FootScanner© projects structured light onto the foot in such a way that no physical contact is necessary. The FootScanner FTS-2© is especially recommended for the conception of made-to-measure lasts, either standard or orthopaedic. The FootScanner FTS-4©, the most advanced of the FootScanner© series, is a 3D foot digitiser that allows the instantaneous capture of a load bearing foot in order to create a 3D computer model of the foot. This uniquely designed FootScanner© projects structured light onto the foot in such a way that no physical contact is necessary. The FootScanner FTS-4© is especially recommended for the most complex orthopaedic cases, as it captures 100% of the surface of the foot, up to 25 cm of the lower leg. The compact, lightweight and easy to operate SoleScanner© is a 3D sole digitiser that allows the automatic, precise, instant and contact free capture of the plantar surface of the foot in order to extract a 3D virtual mould. This 3D generated mould can be transferred to manufacture even the most complex orthotics. The SoleScanner© Direct Scanner is IDEAS scanning technology mounted on a tripod and optimized for non weight bearing direct scanning of the plantar surface. This method of scanning allows the practioner to position the foot correctly before scanning. Scanning is automatic, precise and instant and provides contact free capture of the plantar surface of the foot in order to extract a 3D virtual mould. You can define the met head and heel point. This 3D generated mould can be transferred to SoleCAD to manufacture even the most complex orthotics. The HandyScanner is based on a CreaForm ERGOscan 3D handheld scanners with a very easy, intutive and powerfull software from TechMed 3D to create shapes and measures of body parts. This 3D scanner is innovative and efficient in the orthotic and prosthetic industry, amongst others. The ERGOscan technology uses rapid and high precision shape acquisition independant from any movement of client or patient or magnetic field variation. The Techmed 3D software makes it very easy and intuitive to scan body parts. The HandyScanner is portable and an excellent alternative to traditional methods. DigiTab© is an A3 digitisation tablet, coupled to powerful software specially developed for the design of lasts, starting from 2D elements (soles, profiles, footprints and style lines). This system enables you to trace a 2D profile in order to construct a 3D image. The ArmScanner© is a compact and user friendly mechanical 3D digitising device, that allows the efficient digitisation of shoes, lasts, special last elements, sole modules, orthopaedic moulds and style lines. The ArmScanner© is the interaction between a precise mechanical device and powerful modelling software for the footwear industry and orthopaedic technicians. The 3D BodyScanner© allows the automatic, precise, instant and contact free capture of all axial parts of the body in order to create a 3D virtual model. This model can be used to manufacture made-to-measure corsets, braces, prostheses, etc.